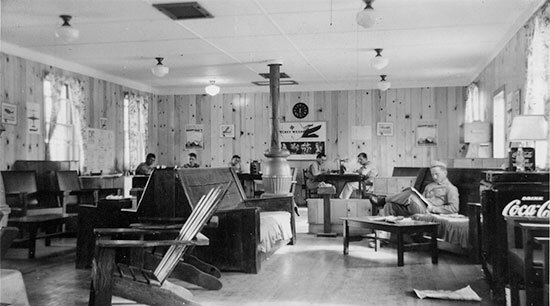 Partial view of the Enlisted Men’s Dayroom at Camp White, Medford, Oregon. This was the Post where the 24th Field Hospital was activated August 19, 1943 and where the organization was stationed until May 15, 1943. The 24th Field Hospital was officially activated at Camp White, Medford, Oregon, on August 19, 1942 (Division Camp; acreage 49,638; troop capacity 1,884 Officers and 35,557 Enlisted Men –ed). The organization was constituted by General Order # 62, Headquarters Ninth Service Command, Fort Douglas, Salt Lake City, Utah, dated July 27, 1942. Subject orders were amended by Special Order # 221 issued by Headquarters AAB Morris Field, Charlotte, North Carolina, dated August 11, 1942, followed and amended once more by Special Order # 223 issued by Headquarters AAB Morris Field, Charlotte, North Carolina, dated August 12, 1942. The initial cadre for the new unit consisted of 1 Officer and 24 Enlisted Men. The Hospital was reorganized under T/0 8-510 dated February 28, 1942, as per Letter War Department, The Adjutant General’s Office, Washington DC, Subject: “Reorganization of Medical Units”, File AG 320.2 (3-12-43), dated March 15, 1943. It was further reorganized under T/O 8-510 dated April 8, 1943, in compliance with Paragraph 4, General Order # 36, Headquarters Services of Supply, South Pacific Area, APO 502, dated September 20, 1943. The 24th Field Hospital was to open its doors to receive patients starting September 29, 1943, as per Verbal Orders and instructions, received from the Commanding General, XIV Corps, U.S. Army, N.G.O.F., APO 453. When operating, a Field Hospital could be considered as a mobile type of Station Hospital. It was of great value under jungle conditions where it could serve at an Air Landing Field as a kind of small Evacuation Hospital. When fully staffed a Field Hospital could perform approximately 80 operations a day. A single Field Hospital Platoon (or Hospitalization Unit) supported an Infantry Division and was usually located at the level of a Clearing Station. Its basic function was to operate solely on casualties suffering from chest, abdomen, or large bone or leg injuries. Of course, other wounds were treated at the same time, but the idea was to bring major surgery as close to the frontline as possible. All other casualties followed a kind of standard route back to the Evacuation Hospitals. 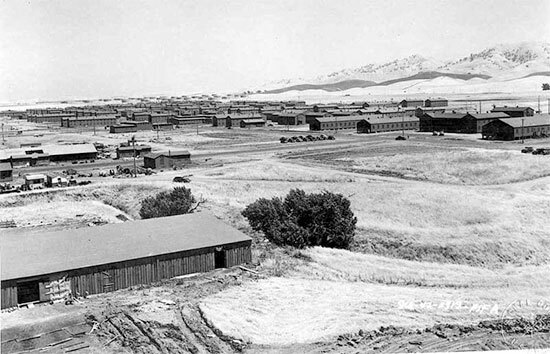 Partial view of the barracks at Camp Stoneman, Pittsburg, California, where the 24th Field Hospital staged prior to overseas movement. The unit remained at Camp Stoneman from May 16, 1943, to June 7, 1943. Additional training exercises were conducted at the Post such as: Abandon Ship Drill, Dry Land Ship Training, Gas Chamber, as well as Obstacle and Infiltration Course. It was estimated that 85% of those soldiers operated on in Field Hospitals survived. When post-operative patients grew strong enough, they were dismissed and transported by ambulance to the Evacuation Hospitals. The Camp White Station Hospital, opened on August 19, 1942, was served by the Medical Division, Service Command Unit 1913. When finished, it was the best equipped 1400-bed military medical facility on the West Coast. It was constructed of brick rather than wood (timber shortage caused by military camp construction in the ZI –ed). A second hospital training facility, located in the NW corner of Camp White, was dedicated to training of Evacuation and Field Hospitals. SCU 1913 not only staffed the Post medical facility at Camp White but also was involved in the training of many tactical hospitals. By August of 1943, these units included: the 79th – 80th – 81st – and 83d General Hospitals; the 316th and 318th Station Hospitals, and eventually the 23d and 24th Field Hospitals. The 41st – 42d – 43d – 44th – and 45th Portable Surgical Hospitals equally trained at Camp White, Oregon. Illustration of M/S Poelau Laut which carried the 24th Field Hospital overseas, departing San Francisco Port of Embarkation June 8, 1943, with destination New Caledonia. January 30, 1943 – the 380-bed 24th Field Hospital is requested for service in the Pacific Theater. May 6, 1943 – the unit is approved for overseas service and is to become available soon, although it is incompletely trained. May 13, 1943 – following receipt of Special Order # 112, Headquarters Camp White, Medford, Oregon, the 24th Field Hospital is transferred to Camp Stoneman, Pittsburg, California. May 17, 1943 – the 24th Field Hospital reports at the San Francisco Port of Embarkation with an estimated date of departure set for May 28, 1943. May 31, 1943 – SFPE authorities report that M/S “Poelau Laut” is not ready, and will not sail until June 4, 1943 (while docked in a US port, June 1941, the M/S Poelau Laut was seized by the US Coast Guard, this Dutch ship was later used by the War Department for operations in the Pacific, while retaining its Dutch captain and Javanese crew, following its conversion to a troopship, its capacity provided accommodation for 2,200 troops –ed). June 5, 1943 – Special Order # 157 issued by Headquarters Camp Stoneman, Pittsburg, California, confirms that the 24th Field Hospital is to move overseas for service in New Caledonia. June 5, 1943 – SFPE confirms that the M/S “Poelau Laut” (ship number SF 872) will sail on June 7, 1943. Unit strength of the 24th Field Hospital at June 8, 1943 is 17 Officers + 235 Enlisted personnel. 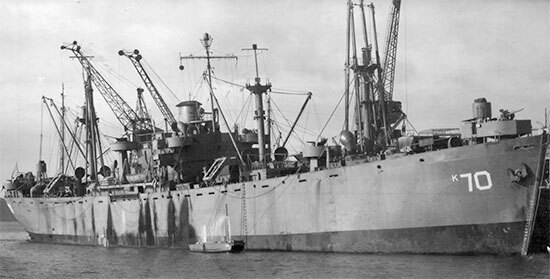 June 8, 1943 – the 24th Field Hospital leaves SFPE on the M/S “Poelau Laut” bound for the Pacific Theater. June 14, 1943 – Adjutant General’s Order # 76 assigns the unit to the South Pacific Area, APO 502. July 6, 1943 – the unit debarks in New Caledonia, Southwest Pacific Area. July 7, 1943 – Amendment No. 3 to AG Order # 76 orders the unit to travel to Guadalcanal and assigns the Hospital to the Commanding General, XIV Corps, Major General Oscar W. Griswold. 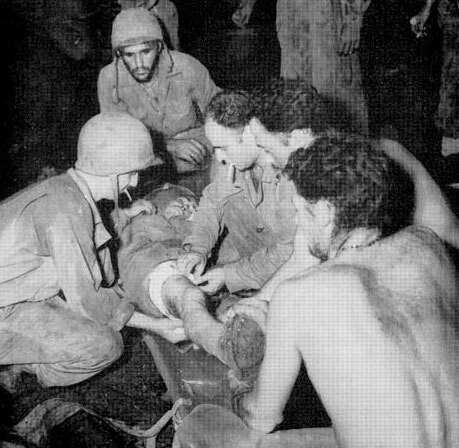 July 31, 1943 – the 24th Field Hospital debarks at Guadalcanal, Solomon Islands. September 6, 1943 – Western Task Force Loading Order # 70-43, dated September 4 (Forward Echelon) and Western Task Force Loading Order # 73-43, dated September 6, 1943 (Rear Echelon) assigns the organization for participation in operations on New Georgia, Northern Solomon Islands. September 8, 1943 – the Hospital is reorganized pursuant to General Order # 36, Headquarters Services of Supply, instructing the CG XIV Corps to take the necessary action at the earliest practicable date for activating the Hospital in the area. September 9, 1943 – the last complement of the unit consisting of 7 Officers and 82 Enlisted Men departs Guadalcanal for New Georgia, Solomon Islands. September 10, 1943 – the Commanding General XIV Corps, advises that the 24th Field Hospital has arrived at Rendova Island complete, and is expected to open for patients about September 20, 1943. November 17, 1943 – General Order # 57, Headquarters Services of Supply, assigns the Hospital to New Georgia. 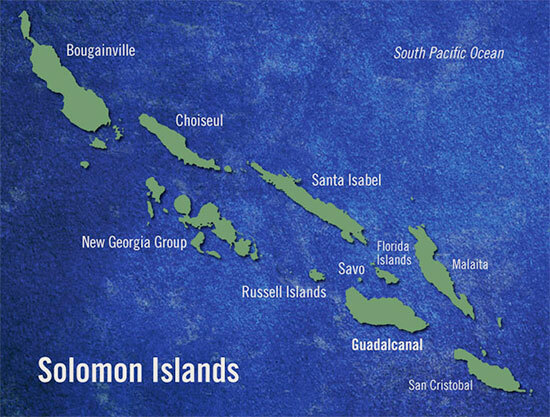 Map illustrating the many islands of the Solomons group, where the 24th Field Hospital served. January 11, 1944 – Movement Order # 10, Headquarters Services of Supply, reassigns the Hospital to the Russels Islands, Solomon Islands, and relieves the organization from assignment to New Georgia. February 17, 1944 – Amendment to Supplemental Letter to Movement Order # 10, issued by Headquarters Services of Supply, changes destination to Guadalcanal, Solomon Islands. March 5, 1944 – Movement Order # 40, issued by Headquarters Services of Supply relieves the unit from assignment in Guadalcanal, and reassigns it to New Ireland, Bismarck Archipelago (code name “Forearm”) , effective March 15, 1944. March 7, 1944 – 17 Officers and 210 Enlisted Men embark at New Georgia on USS “Crater”, AK-70. March 8, 1944 – above personnel from the 24th Field Hospital debarks at Guadalcanal. March 17, 1944 – General Order # 18, Headquarters Services of Supply, directs reorganization of the 24th Field Hospital, effective April 1, 1944, under T/O & E 8-510, dated September 28, 1943, and in compliance with Paragraph 1, Section II, Secret General Order # 18, issued by Headquarters Services of Supply, APO 502, dated March 17, 1944. March 21, 1944 – Amendment No. 2 to General Order # 40 reassigns the unit to Emirau Island (code name “Beefsteak”) instead of to New Ireland (code name “Forearm”), effective March 15, 1944 (reason: cancelled operations against New Ireland –ed) . March 25, 1944 – 17 Officers and 186 Enlisted Men debark at Emirau Island, Admiralty Islands. April 30, 1944 – 2 Officers and 20 Enlisted Men debark at Emirau Island from LST # 39. 1943; somewhere in the South Pacific Area. 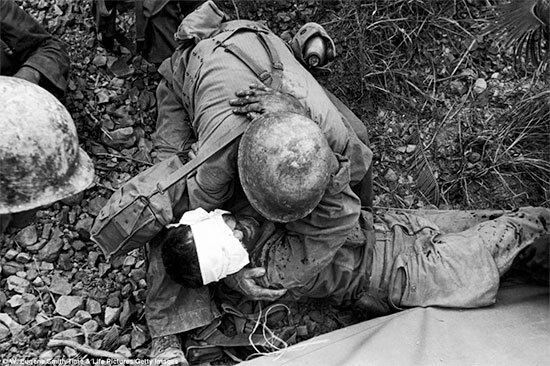 Medical Department personnel comfort a wounded soldier. The 24th Field Hospital officially started operations as of September 29, 1943. Its authorized strength on October 1, 1943 was 17 Officers and 234 Enlisted Men (at the time no Nurses were serving with the organization –ed). Authority ordering operations in the Northern Solomons Campaign was issued by Paragraph 2, General Order # 483, Headquarters United States Army Forces in the South Pacific Area (USAFISPA), APO 502, dated December 12, 1943. By the end of the year, December 31, 1943, total strength was: 15 Officers + 227 Enlisted Men. Illustration showing the installations of the 24th Field Hospital on New Georgia, October 27, 1943. By the end of the month, March 31, 1944, total strength comprised: 19 Officers + 208 Enlisted Men. The 24th Field Hospital opened to receive patients at 0001 hours, April 1, 1944, on Emirau Island (St. Matthias Group). The organization later moved to another site on Emirau on June 6, 1944. Authority ordering operations in the Admiralty Islands was issued by General Order # 955, Headquarters United States Army Forces in the South Pacific Area (USAFISPA), APO 502, dated June 13, 1944. In compliance with Movement Order # 85, Headquarters XIV Corps, APO 543, dated November 15, 1944, the 24th Field Hospital was en route to Luzon, Philippine Islands, from December 11, 1944 to January 9, 1945. August 1943; Clearing Station run by the 37th Infantry Division. This unit was one of the many infantry organizations serviced by the 24th Field Hospital. I Corps possessed in addition the 29th – 54th and 92d Evacuation Hospitals; the 5th – 23d – 37th – 43d Field Hospitals; the 7th Medical Battalion, two Companies of the 263d Amphibious Medical Battalion, and the 6th – 11th – 15th – 55th – 56th – 57th – 61st – 62d and 63d Portable Surgical Hospitals. Backing XIV Army Corps, were the 7th and 21st Evacuation Hospitals, the 24th and 41st Field Hospitals, the 135th Medical Battalion, the 264th Amphibious Medical Battalion, as well as the 20th – 21st – 24th – 31st – 33d and 38th Portable Surgical Hospitals. 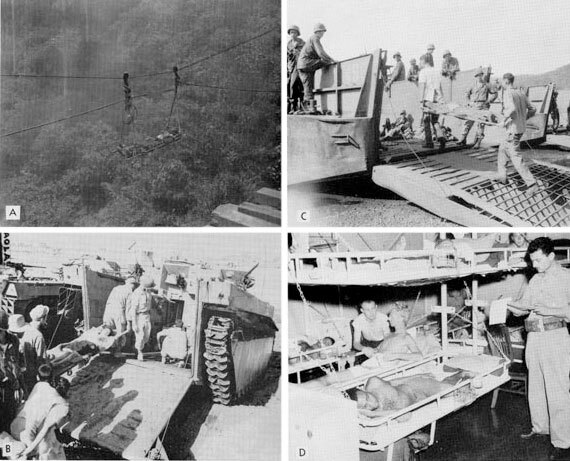 Methods of evacuation in the Southwest Pacific Area, 1945. A. Litter carry over deep ravine by cables. Evacuation of casualties during the fighting in the Pacific region was always a problem. Portable Surgical Hospitals were sometimes miles ahead in the jungle. Tactical hospitals would follow the Infantry and usually set up a few hundred yards from the enemy. Evacuation was necessarily a complicated process. At first evacuation took place by litter, sometimes by hired natives, but more often by Army litter bearers, because of the hazards of combat. Sometimes, heavily depending on the terrain, evacuation was by ambulance jeeps, ox-drawn carts, or by amphibious vehicles. For its first mission in the Philippines, the Hospital was attached to the 37th Infantry Division (XIV Corps) and was to land on orders of the CG, 37th Division and set up and operate as an Evacuation Hospital. The unit’s function would be to receive casualties from the combat troops moving down the Luzon Valley. The general scheme and chain of evacuation contemplated; receipt at the Division Clearing Stations – transfer to the 24th Field Hospital – evacuation to Collecting Company C, 264th Amphibious Medical Battalion and Collecting Company A, 264th Amphibious Medical Battalion – and final transfer to the Shore Medical Group, and the beach. The last operation would include transfer to the LST-Hospitals on call offshore. Depending on local circumstances, patients could also be evacuated to designated airfields or strips. Both Collecting Companies were to set up Holding Stations at points of evacuation in order that such operation would be constant at all times. It must be noted that as the distance from the hospitals and the Lingayen base increased, air evacuation became a necessity. 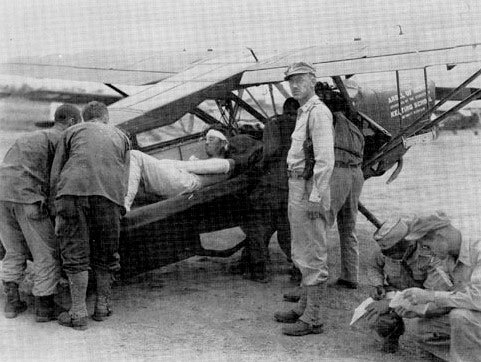 Since ambulance hauls and evacuation by land became too long and too dangerous, serious surgical cases indeed required quick treatment, it was decided to use small planes for evacuation (mainly L-5 Stinson Sentinel or the larger UC-64 Noorduyn Norseman aircraft –ed) and as soon as larger airstrips were seized or built, C-47 cargo planes were able to relieve the burden on local medical units by carrying the wounded to Leyte. July 1943; Aid Station established in the jungle on Rendova Island, where casualties received the necessary basic treatment prior to evacuation to a Hospital for further care. January 9, 1945 – the 24th Field Hospital lands at Lingayen Gulf, Luzon, Philippine Islands. January 11, 1945 – the organization sets up for operation and receives its first patients. January 16, 1945 – Paragraph 12, General Order # 9, Headquarters Sixth United States Army, APO 442, dated January 27, 1945, confirms transfer of the 24th Field Hospital from XIV Army Corps to Sixth Army. January 20, 1945 – the Hospital closes for receipt of patients and transfers all remaining sick and wounded to the 7th Evacuation Hospital. January 30, 1945 – the 24th Field Hospital closes its present site for operations and transfers all its patients to the 21st Evacuation Hospital. May 28, 1945 – following receipt of new movement orders, the organization sets up at a new site further inland. July 1, 1945 – General Orders issued by Headquarters, Sixth United States Army, announce that the 24th Field Hospital will end its stay in Luzon, Philippine Islands, by July 4, 1945. September 1, 1945 – It is anticipated that the Hospital will be part of the American Occupation Forces in Japan. Further instructions are to follow. September 6, 1945 – the 24th Field Hospital departs Luzon for a new destination. In compliance with Top Secret Movement Orders issued by Headquarters XIV Corps. Between September 6 and September 17, 1945, the organization was enroute to Honshu, Japan, where it was to be attached to Headquarters Eighth United States Army. December 14, 1945 – the Hospital arrives at Honshu, Japan. The general hospitalization policy applicable during the initial phase of the Lingayen Gulf operation was the following: subsequent to the assault phase, only those patients requiring fourteen days or more of hospitalization were to be evacuated to rear bases, unless determined otherwise. Evacuation was to take place either by air or by water. Before US forces could launch the attack on Luzon Island, bases (primarily air bases were of great importance) needed to be established close to the island. Troops under Brigadier General William C. Dunckel captured the Island of Mindoro. By December 28, 1944, two air bases were under control and were ready to assist in the assault against Luzon, scheduled to be launched January 9, 1945, designated “S-Day”. With the capture of Mindoro, US forces were now positioned south of Luzon Island. The plan however was to land at Lingayen, further north as this would place American invasion forces close to several highways, roads, and railways on Luzon, leading to Manila, which remained the main objective of this campaign. Upon landing (January 9, 1945), the 24th Field Hospital moved inland from the beaches and bivouacked in the vicinity of Lupis, a coastal town situated some 110 miles northwest of the capital Manila, for the nights of January 9-10. The organization did not set up for operation at this site since casualties were light and progress was so great that it would not have been feasible to establish a complete hospital. The bivouac days were utilized for movement of supplies from the beach to the bivouac area. On January 11, 1945, the Hospital was ordered to move to Binmaley (included into the area of Yellow Beach –ed), set up for operation immediately and begin receiving patients. The 24th Field was located approximately one half mile east of the city square on the main highway. Although the area was small, the necessary facilities were available to accommodate about 400 patients. 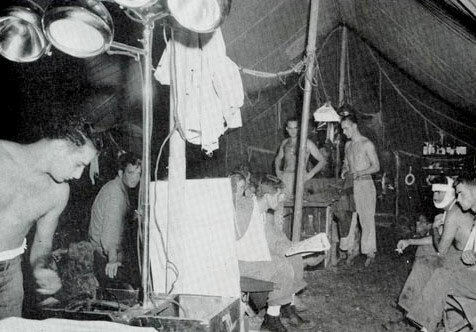 Since no buildings were available, the unit operated under canvas. The mission at Binmaley was mainly to care for Filipino civilians who had been injured from the initial air and naval bombardment, prior to the landings. During the immediate phase of operations, evacuees were taken to the 7th Evacuation Hospital, located at the Lingayen airstrip. Unfortunately, evacuation by air could not be effected immediately since the strip was not in a condition to be used, and therefore those patients were evacuated from the beach to ship. Illustration of USS Crater, the Troop Transport that carried elements of the 24th Field Hospital from New Georgia to Guadalcanal March 7-8, 1944. Following the unit’s attachment to Sixth US Army, the 24th Field Hospital, together with the different Medical Battalions was now being controlled by the 135th Medical Group which was tasked with organizing on –and offshore evacuation, once Headquarters were ashore and the different Battalions had passed to the Group’s control. Units such as the 70th – 135th – 263d and the 264th Medical Battalions were to play a key role in the evacuation process! The 135th Medical Group also coordinated the work of the Beach Clearing Stations and Holding Units set up at the various airstrips. Although it had been planned that hospitals would have small airstrips near their sites where L-5 aircraft could land, this policy did not go into effect until much later (Engineers were much on demand almost everywhere at the time). Evacuation by water took the seriously ill and wounded to Leyte, and when hospitals became crowded, to Biak. 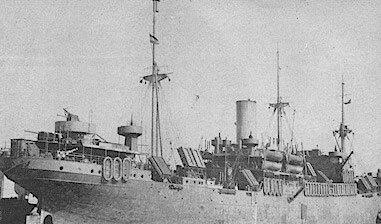 Hospital LSTs, medically-equipped APAs and Hospital Ships carried the wounded on slow journeys to other destinations. At 1400 hours, January 20, 1945, the Hospital Detachment of Patients operating at Binmaley was closed. All patients were transferred to the 7th Evacuation Hospital. The Hospital eventually reopened at Camiling, about 93 miles northwest of Manila, in the Province of Tarlac, where the men were able to utilize a group of empty school buildings which were readily adapted to a hospital setup allowing for almost immediate operation. Elementary School No. 3 was situated on the National Highway, approximately one mile north of Camiling square. Here, as in Binmaley, the unit was medically supporting the 37th Infantry Division whose casualties they treated and hospitalized. One building housed the Surgery and X-Ray Sections, and it must be noted that the other buildings provided ample space for all Clinics and Wards. Evacuation was effected by ambulance to the 21st Evacuation Hospital established at San Carlos, with vehicles provided by the 135th Medical Group. The battle for the capture of Clark Field began on January 24, 1945, when the 40th Infantry Division advanced along the hills to the north of the main airfield while the 37th Infantry Division, progressed from Bamban to Mabalacat, Dau, and Angeles across the airfield. The battle was to last from January 24 to January 31, whereby the Japanese defenders lost all their armor and heavy weapons. The surviving enemy retreated into the Zambales Mountains to continue their resistance until February 20. After the capture of the airfield complex, Clark Field was guarded by the 40th Infantry Division which also conducted mopping up operations, while other American units continued their advance toward Manila. On January 30, 1945, the organization prepared for another move. The 24th transferred all remaining patients to the 21st Evacuation Hospital and then moved on to Dau. The new hospital site was located on National Highway No. 3, approximately 2 miles north of Angeles, 7 miles south of Mabalacat, and near to Airstrip # 2, Clark Field. The site itself was a former Filipino garrison hospital named Camp del Pilar. It consisted of permanent buildings which the Japanese had taken over and utilized. Consequently they needed much repair and cleaning prior to any possible use. The main building was allocated to the Surgery Section while additional small rooms were utilized for Clinics and Administration. The theater auditorium and stage conveniently housed approximately 174 acute surgical patients. As the place was really large, three 2-story barracks were used to accommodate 250 more patients, and two thatch-roofed other buildings were converted into wards with a capacity for approximately 1500 beds, two Operating Rooms, one Mess Hall, and some Offices. Emergency air evacuation conducted by light aircraft which could easily operate from small or temporary airstrips. 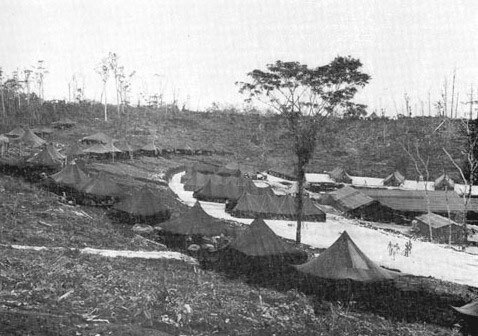 The unit’s mission was mainly to receive and hospitalize casualties from combat troops moving down the Luzon Valley and also to treat troops operating in the hills west of Clark Field (Clark Field was well expanded by the US Army and Air Corps over the years until 1941 and comprised a total of 12 different airfields which represented an important prize, when captured –ed). 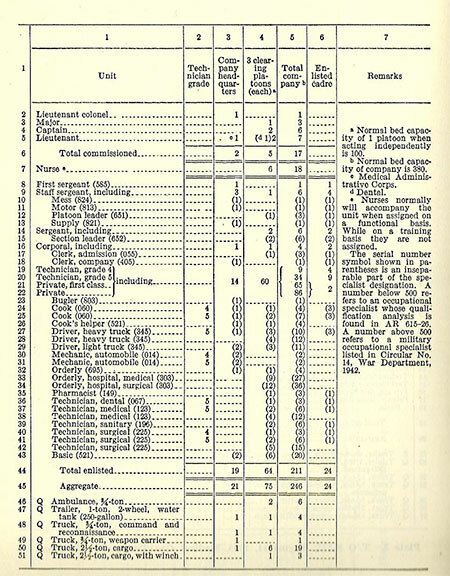 Casualties were so high that in a very short period of time, the patient census had increased well over 1000. It was therefore necessary to send two Surgical Teams from the 237th and the 364th Station Hospitals to augment the unit’s capacity and also include subordinate units pertaining to the 135th Medical Group. On March 19, 1945, 80 Nurses obtained from the 80th General Hospital were attached to the staff which added greatly to the care of the patients. This was the first occasion that female Officers (ANC personnel) served with the organization. During the Hospital’s stay at Camp Dau, it cared for troops of several Divisions, namely, the 37th – 38th – 40th and 43d Infantry Divisions as well as elements of the 6th Infantry Division. When the Fifth United States Air Force moved into Clark Field, they too received medical support from the 24th Field Hospital. The organization also provided treatment to several naval units deployed in the area. Evacuation at Camp Dau were in the early stages taken care of by ambulances evacuating their patients to Company A (Collecting Company –ed), 264th Amphibious Medical Battalion, which was located approximately three miles north of Mabalacat. Here a Holding Station was established near an airstrip so that patients could be flown out by L-5 and C-47 aircraft. At a later date, another airstrip was constructed only one mile from the hospital area and evacuees were then sent out directly by air. During actual combat, the Surgical Section was greatly expanded over the Medical Service and the Hospital operated and functioned as any Evacuation Hospital would do. The unit serviced troops at Camp Dau until May 28, 1945, when it received orders to move to Cabanatuan, in Nueva Ecija. Upon arrival, the organization was set up on the grounds of the Provincial School. As only a single building could be provided, patients were for the most part housed in ward tents adjacent to the building. The bed capacity was limited to 500 patients. The main function of the 24th Field Hospital at Cabanatuan was to service troops of the 43d Infantry Division who were at a rest camp near Cabanatuan. This resulted in receipt of few battle casualties, allowing the personnel to enjoy some rest and recreation. Troops served by the 24th Field Hospital during the Luzon campaign were of an enormous variety. They not only included other medical units such as the 410th Medical Collecting Company – 115th Medical Battalion – 402d Medical Company – 712th Medical Sanitary Company – 983d Motor Ambulance Company – 19th Port Surgical Hospital – 21st Port Surgical Hospital – 6th Medical Battalion – 893d Medical Clearing Company – 5th Port Surgical Hospital but many other large and small units pertaining to the Army Air Forces and numerous other branches of service. By letter Ref. AG 321 (Med) (FE) issued by Headquarters Eighth United States Army, Office of the Commanding General, APO 343, dated December 1, 1945, Subject: Letter Order # 12-2, “Inactivation of Certain Hospital Units”, addressed to the Commanding General, XI Corps, APO 471, the 24th Field Hospital was to be inactivated at its present station, effective December 15, 1945. The letter was issued by command of Lieutenant General Robert L. Eichelberger, and signed by Colonel Ward W. Conquest, AGD, Adjutant General, Eighth United States Army. 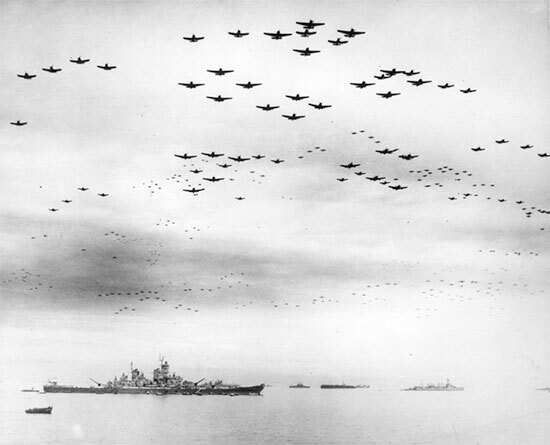 September 2, 1945; impressive number of US fighter planes over the battleship USS Missouri during the Japanese Surrender ceremony. With regard to personnel, all Regular Army Officers and volunteer Officers were to be reassigned to units falling under the jurisdiction of the CG, XI Army Corps. Personnel, both Officer and Enlisted, eligible for return to the Zone of Interior under the current critical ASR score or for length of service, were to be transferred to the 4th Replacement Depot, Yokohama, Japan, APO 703. Reference to Eight US Army Readjustment Regulations RR-15 and RR-16. Ineligible personnel, other than Officers mentioned above, were to be reassigned by the Commanding General, XI Corps. Enlisted Men with MOS 405 – MOS 247 – or MOS 213 were to report to Corps Headquarters, attention of Operations Section, G-1, Eighth United States Army. All supplies and equipment in possession of the units to be inactivated were to be disposed of as provided by Circular # 278, cs, issued by Headquarters Eighth US Army. Personnel permitted to return to the United States were to be provided with clothing and individual equipment as outlined in Circular # 270, cs, of subject Headquarters. Pursuant to Instructions of WD Radio WCL 21688, dated November 18, 1945, AFPAC Radio 21242, dated November 21, 1945, and under the Provisions of War Department Readjustment Regulations 1-6, the following unit is inactivated at its present station, effective December 15, 1945 (Orders were issued by Headquarters Eighth United States Army, File AG 321 (MED) (FE), APO 343, dated December 1, 1945 –ed). The MRC Staff are still looking for a complete Personnel Roster of subject Hospital and any specific period photographs related to the organization. All inputs appreciated.